To contact Mahalo Records, the owner of this recording, about the licensing for the use of any part of this album, press here. To buy this album, please contact one of our distributors listed below. Long associated with the Jazz Age and the era of wonderful nonsense, the ukulele, down through the years, has been considered a novelty and certainly not an instrument to be accorded serious attention. To the people of Hawaii, however, the uke has held a place of honor in the family of stringed instruments (along with the Spanish and steel guitar) from the early 19th century when Portuguese mariners first introduced it to the islands. Hawaiians have long featured the ukulele as a solo instrument, not merely as an agent of accompaniment. Eddie Kamae, acknowledged to be Hawaii's most gifted ukulele artist, has endeavored throughout his lifetime to gain for the instrument its rightful place in the music world. Island born, of mixed Hawaiian, Chinese and American Indian ancestry, Kamae began in early childhood the serious study of the uke. Still in his teens, he debuted on the Honolulu concert stage to the unanimous praise of critics and public alike. A tour of the continental U. S. concert scene brought the same reaction. Recent visitors to Hawaii will remember him as the featured artist in the Royal Hawaiian Hotel's famed Polynesian Show. Known in Hawaii as a virtuoso of the uke, Eddie has perfected a number of strokes which, until now, have seemed impossible to achieve with the instrument. The soaring Granada and Sorrento attest to this "new look." The magnificent Hawaiian melodies, certainly among the most beautiful ever written, have never sounded more majestic than here under the Kamae touch. If during the playing of this album you feel the excitement and electricity of a live performance, it's not by accident. Most of the numbers were recorded in a single take and reveal the spontaneity and invention usually attained in concert. During the playback, we noticed the audible breathing, sighs and near-sobs of an artist totally immersed in his work, oblivious of the technical problems attendant. Because we feel that this is so much a part of Eddie Kamae's concert artistry, we have not edited this portion of the performance. When you hear these selections, you too will feel not only the heart of the ukulele, but the heart and very soul of a gifted artist as well. NOTE: Eddie Kamae was born August 4, 1927 in Honolulu, moved to Maui with the family when a few days old and lived there for nine (9) years before returning to Honolulu where he graduated from Farrington High School. He served in the Army during Pearl Harbor and was discharged in 1946. 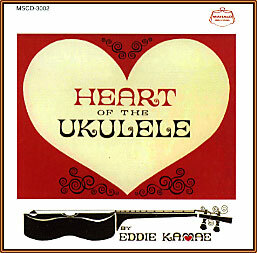 In 1948 Eddie and Shoi Ikemi teamed up as the "Ukulele Rascals" at the Waikiki Lau Yee Chai. In 1950 he left entertainment until 1957 when he staged a comeback at the Top of Waikiki night club. When the club closed Eddie switched to the music of Old Hawaii. His career reached a turning point. Eddie, Gabby Pahinui, Joe Marshall, and Dave "Feet" Rogers formed the "Sons of Hawaii." The Sons of Hawaii disbanded and reorganized several times with different musicians, but Eddie was always the spirit of cohesion. Finally the group disbanded for good and Eddie turned to researching Hawaiian Music on a full time basis. Today Eddie continues his research along with the production of Hawaiian cultural documentaries. His goal is to document, preserve and perpetuate the cultural heritage of Hawaii through music, film, and video. Web Site Copyright© 2019 - Surfside Hawaii, Inc.